Published by Snowbooks in 2009, released February 2010. 'I am trying to decide whether or not I want to carry on living. I'm giving myself three months of this journal to decide. You might think that is melodramatic, but I don't think I'm alone in wondering whether it's all worth it. Fiona Robyn actually contacted me and asked me whether I would be interested in reading her latest book. Never one to turn down a free book, I was very interested to read it, as Fiona was not an author I was familiar with. The book follows the life of Ruth over a thirty day period. It is written in the form of a journal where Ruth writes about her feelings and her life everyday. This journal is an unusual one, as Ruth is writing it to give herself 30 days to decide whether or not she wants to finish her own life. She is depressed and self harming herself on a regular basis, reaching the end of the line. Ruth writes about all the people that come into her life and how she feels about them and her feelings for herself. This is a depressing story, but a good depressing story. It is really moving and thought provoking as you follow Ruth on her journey to making her decision. Ruth begins the book as someone completely alone. She lost her mother when she was young and has a difficult relationship with her father. She doesn't really have any close friends and hasn't had a serious relationship in years. At the beginning of the thirty days she is at a real low. As the book progresses you watch Ruth gradually let people into her life. She contacts her aunt whom she hasn't seen since her mother passed; she gets herself a Russian boyfriend whom she hired to paint her portrait and she starts to make friends. I imagined Ruth as a rosebud slowly opening up and letting the sunlight and the rain in. The book deals with self harming in a lot of detail. Ruth likes to cut herself as she finds it a release. I found this quite difficult to deal with as it something I don't really understand the reason for. I don't suffer with depression, so I can't comment on how it feels. I think this would be a good book for someone who does, so that they can see you can come back from the edge, with the help of others, if you let them in. The only thing I didn't enjoy about the book is the ending. I found it a little ambiguous. I am presuming that Ruth made the right decision in the end, but I am not actually sure. I read the last couple of pages over a few times and I didn't think it was overly obvious and I wondered if I was missing something. On the whole, a good read, depressing in content, but a truthful look at life. 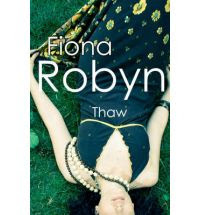 Fiona Robyn is going to blog her novel, Thaw, starting on the 1st of March this year. To help spread the word she’s organising a Blogsplash, where blogs will publish the first page of Ruth’s diary simultaneously (and a link to the blog). I f you are interested in joining in, click on the link in brackets. As someone who has experienced depression and that feeling of wanting to end it all I don't know if I would want to read this. Especially if it seems unresolved at the end. It is probably a very good book - not one for me though methinks :) Good review Vivienne. While the subject matter does indeed sound depressing - I am fascinated by the premise of this book. I am currently reading a book about how to keep a journal and one of the suggestions is to designate one journal for a particular focus. We all have a story to tell, and I will be anxious to read Ruth's. Good to be back with you. Thanks you so much for the concern shown, I can't begin to tell you how much it meant to me. I'm busy having a bit of a catch-up and was delighted to read your Christmas Part 4 post - as always it brought a warm glow to my heart. Thanks Vivienne. I read a book about cutting last year and it did make me understand it a little, although I could never do it. I'm not crazy about ambiguous endings either, so I know how you felt. "I imagined Ruth as a rosebud slowly opening up and letting the sunlight and the rain in." Lovely thought, Vivienne. It sounds as if there are some bright spots in this book. I've never understood the need to cut oneself (I suppose that's a good thing) for relief. The psychology behind this type of self-mutilation baffles me. Carmen - I really do feel for anyone that has suffered depression and hope that one day they can move past those feelings. I don't understand how they can move on as it isn't an illness I have ever suffered with, but I can see that people can move on eventually. I was amazed to read that you had suffered with it, as you always seem so full of life. I am glad you are in a better place now. Molly - it really is an interesting book, even though it was depressing. I like the idea of writing a journal. Blodeuedd - I still don't understand how it gets rid of the numbness, it must hurt like hell. Amanda - it might be good for her to read this to make her realise she is not alone and that it is quite common. Petty Witter - it is lovely to have you back and I did think of you when I put up my journal pics. Bermudaonion - the ending was really annoying and I may have to ask the author to clarify. Suko - I read your first line and thought that is a lovely sentence and then realised I had written it. There is a writer hidden within me somewhere. The cutting thing is complicated. I've been there, briefly in my late teens, and it wasn't easy. Sounds like a book I need to read. I've never really been able to understand about cutting either (thankfully). The book does sound like it addresses some very important issues, but I would really have to be in the right mood to deal with it. I tend to prefer ambiguous endings - I think I must be unusual that way. Really good review Viv and ths is definitely a book I'd like to read. Great review Viv. This sounds like something I would like reading.